One-Year Volunteer: 1 October 1912. 1 October 1912: Entered the Army as a One-Year Volunteer in the Grenadier-Regiment König Wilhelm I (2. Westpreußisches) Nr.7. 2 August 1914: In the field with the 4. Schlesisches Infanterie-Regiment Nr.157. 1 December 1936: Operations Officer (Ia) in the General Staff of the IV Army Corps. 1 May 1939: Commander of Infantry Regiment 34 of the 35th Infantry Division. 10 October 1939: Chief of Department 4 under the Senior Quartermaster II (Deputy Chief of Staff for Training) of the Army General Staff. 1st April 1945-1947: Prisoner of war in British captivity. 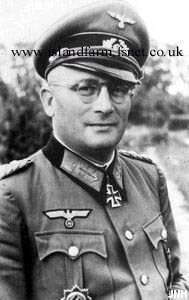 Knight’s Cross of the Iron Cross: 15 May 1944, Generalleutnant, Commander of the 95th Infantry Division. German Cross in Gold: 9 April 1943: Generalmajor, Commander of the 95th Infantry Division. Although General der Gebirgstruppe Georg Ritter von Hengl was delegated with the leadership of the LIX Army Corps on 25 January 1945, his command never took effect due to illness.